As chemical control choices diminish and concerns for health and the natural environment increase, it’s important to know how to deal with problems. Keeping your plants healthy by good cultivation and sanitation is the best way to prevent pest and disease problems. But despite our best efforts, some diseases can blow in or the weather encourage a sudden increase in pest numbers. Diseases are especially difficult to control once they take hold. The vegetable and fruit garden is of special concern. Here, there are no fungicides on the market for home gardeners to treat fungal infections of edibles grown outdoors. This includes diseases such as peach leaf curl and apple scab. Nip pest populations in the bud before they boom. Use sticky traps or pheromone traps for pests such as whitefly, codling moth and plum moth. Traps may not kill large numbers, but they do play a role in monitoring population rises. In the case of Integrated Pest Management (IPM) - a strategy that uses a combination of control techniques to reduce damage - traps are used as a way to minimise chemical inputs, as they help identify the ideal time to spray. Insect populations can rise and fall. Damage may be tolerable if merely cosmetic but bear in mind that insects may spread diseases such as viruses. These can be especially damaging to young plants, so action ought to be taken. Wash off infestations such as aphids (greenfly) with a hose; pick off pests like slugs by hand. Insects such as hoverflies predate on pests, so grow plants that attract them into your garden. Hoverflies have short tongues so open flowers such as those in the daisy and umbellifer families which have easily accessible pollen and nectar are best. In greenhouses, conditions can be controlled and there is an array of living products to choose from for keeping pests at bay. Outdoors, choice is more limited, and timing to match the vulnerable stage in the pest’s lifecycle is critical, for example nematodes with vine weevil. These are used mainly to combat nematodes in bulbs and herbaceous perennials. Hot water treatment can be used against both white rust and eelworm in chrysanthemums. Some plants are sold as resistant to pests, for example, lettuce selections resistant to root aphid. Often this is more about limiting disease spread rather than eradicating it. Start by clearing up old flowers, leaves and debris. Spot small patches of disease before it spreads so you can take action. For example, ample spacing of pot plants in a greenhouse to stop spread of botrytis (grey mould). By cutting out disease, you may limit the spread. Coral spot is an example where a fungus from infected tissue can grow down into healthy wood. Accurate pruning at the branch collar also enables a tree to compartmentalise decay. 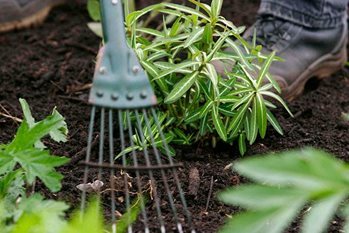 With soil-borne diseases, such as honey fungus, remove infected roots when digging out plants. Break the cycle of reinfection at the end of the season by clearing up infected leaves or fruit. For example, rose leaves infected by rose black spot or apples with brown rot can carry spores from one year to the next. If used as a barrier, mulch can stop disease spores splashing back onto plants. A winter mulch will bury rose black spot spores and stop them re-infecting spring growth. Incorporating organic matter such as green manures into soils can combat fungal pathogens as competitive micro-organisms are created in the decomposition process. The act of cultivating the soil in itself will break up small roots exposing pathogens to the environment. Rotating crops on your veg plot will prevent reinfection of vegetables of the same family by starving out soil-borne diseases (as well as provide better nutrition and healthier plants). For some problems with a wide host range, areas may need to be left fallow for several years. Resistance is not the same as immunity, but it may allow a crop to be harvested before disease takes its toll, as with blight resistant tomatoes. Resistance in edibles is especially important as UK home gardeners are without recourse to fungicides. Some forms of organic gardening permit a limited number of controls that are derived from animal or plant materials. Your own personal viewpoint may or may not permit these. Insecticides derived from natural products may have less impact and persistence in the environment than purely synthetic chemicals. Pyrethrins are an example of this, however they are still chemicals which poison the organisms with which they come into contact. Other natural products are based on vegetable oils, animal oils and soaps. These are classed as surfactants. They act by smothering rather that poisoning pests. They may also kill non-target species such as beneficial insects. In some cases plant-based remedies are the only control option. For example, chemical soil sterilants are no longer available. Instead, mildly toxic compounds released by certain brassica crops, such as mustard 'Caliente' are worked into the soil. These biofumigant materials can reduce some soil pests such as nematodes. They are thought to have negligible adverse environmental impact. In greenhouses, a garlic fumigant is available as a pest disperser. Some people turn to home-made brews as they try to reduce chemical inputs into their gardens. These apparently benign concoctions containing essential oils, washing up liquid or similar are best avoided as they may pollute the wider environment or harm plants, for example by scorch. They can harm a range of organisms and as they are not properly tested, we can't be sure of their environmental effects. Whatever their origin, these products kill pests and diseases, so should be used with discretion.